“At Home with the Water Shrew” was recently juried into the Society of Animal Artists‘ 53rd Annual Exhibition on Art and the Animal. 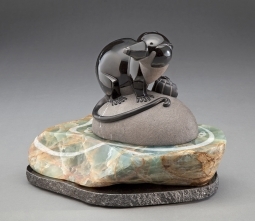 This stone sculpture is also included in the Art and the Animal National Tour. The show will run from August 31 through October 31, 2013, at the Bennington Center for the Arts in Bennington, Vermont. After that, the show will travel to the Hiram Blauvelt Art Museum in Oradell, NJ and the Arizona-Sonora Desert Museum in Tucson, AZ. The final show is at the Booth Museum of Western Art in Cartersville, GA.
travels to Vermont, New Jersey, Arizona, and Georgia. I am very proud to have my sculpture exhibited with the work of the great artists in this organization. Only a small percentage of the artwork chosen is sculpture, and only a small portion of that is stone sculpture. The Water Shrew was a joy to make! I am so pleased he will be seen by art-lovers on the east coast and in the west. Each sculpture design is carved only once, so each piece is seen in only one or two venues before it is sold. I am so pleased this one will be seen in many museums!